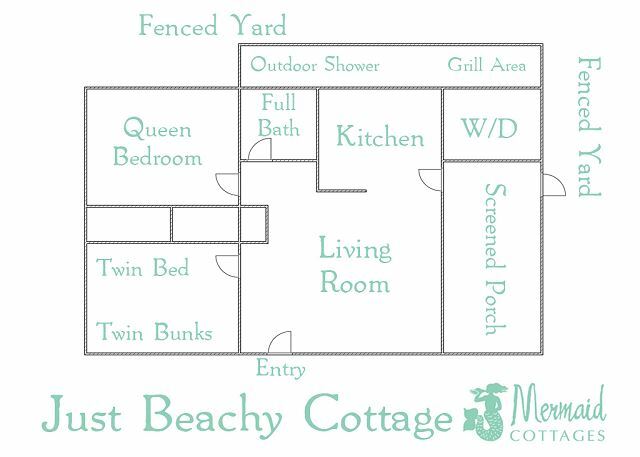 Welcome to Just Beachy Cottage! Just pulling up to Just Beachy lets you know you're at the beach! Welcome to our little Just Beachy! Sleeps 4, and is pet-friendly. Come and sit here and watch the world go by! Bright and cheery, you're going to feel so at home and, well, just beachy! Just minutes to Tybee's little downtown area and minutes to our 'Back River' area, you're perfectly located to park and walk or ride bikes! Outdoor shower for rinsing off your day at the beach! Hot AND cold water! Classic coastal backyard landscaping! Your dogs will love this yard! The wonderful newly renovated screened porch at Just Beachy Cottage! This screened in porch is a whole extra room for you and the family to spread out in! Dragonflies are a great Tybee bug. Living room. This one is inside! You walk into the living room and to your left is the twin beds bedroom. Yes, this home is 'Just Beachy' alright! Open kitchen/living room make this little home spacious! Open living room to the kitchen makes this little space feel so large! Sit here and enjoy some beachy time! Full bathroom has a tub/shower combo. This room has 3 twin beds (1 bunk bed plus extra twin). Twin bed bedroom has 3 twin beds ~ a bunk bed and an extra twin. Twin bed bedroom has 3 twin beds. Twin bed bedroom has 3 twin beds ~ a bunkbed and an extra twin. Fun details - Just Beachy Cottage! Come see us soon at Just Beachy Cottage! Just Beachy Cottage is located just a short 3.5 block walk to the beach. Walk right up Tybrisa St. and you are there! Tybee's south end business district with easy access to shopping, dining, nightlife and attractions like the Tybee Pier and Pavilion and the Tybee Marine Science Center. This adorable cottage offers a great beachy decor and extras like a nicely furnished screened porch, fully fenced back yard, washer and dryer, and wireless internet. There is also a gas grill and outdoor shower with hot and cold water! In the main living space you will find a flat screen TV for entertainment. The kitchen offers a stove-top and oven but NO DISHWASHER. There is a full bath with a tub/shower combo. Both bedroom also have TVs. The front bedroom is furnished with Twin Bunk beds and an additional Twin. The back bedroom has a Queen bed. This cottage offers a fully fenced backyard. There is complimentary WiFi for your use. Parking for 2. There is not Central Air/Heat available in the cottage, instead there are window unit AC in both bedrooms and the living room which do a great job keeping it cool. Sanford's Place is just a few houses away from Just Beachy so two families or several friends could stay close to each other. Enjoyed our stay at the Mermaid Cottage. Everything was wonderful except for the shower, which we had read reviews about. If multiple people are showering, you have to wait at least 30 min between showers for the water to drain if you don’t want to be showering in standing water. Used the outside shower but it did not have a curtain as shown in the pictures. a guest from Macon, GA does not recommend this vacation rental. In my opinion we payed for the location of this property. I realize that this is an older house, however,there were several issues with this property. Number one,the drain for the bathtub is clogged. When you shower the water comes up around the middle of your shins. I saw other reviews while I was there indicating that this has been an issue for over a year. Secondly, the air conditioning units worked during a very hot period,however,the air blows directly on one bed. Also, drips from the back on the screen porch and hot air comes out of the back directly on you if you sit on the seat on the porch. Thirdly, It would be better if it had a dishwasher,but I was aware that it didn't beforehand. On the plus side, the location was great for access to two beaches and was very dog freindly. Loved our stay in this quaint, older cottage. Our dog enjoyed the fenced back yard. We spent some time on the screened porch. It's close to beaches and the pier. We truly enjoyed your long weekend stay. Very close to beach and restaurants. Highly recommend. Great location, cute cottage and superior customer service. I can't wait to go back and will recommend this property and Mermaid Cottages to family and friends. an outstanding job having the place clean and ready for our arrival. A two bedroom was the perfect size for us. Pet friendly. The dogs loved it too. Must go with Mermaid cottages. Its so easy, clean, friendly and affordable. It was great! Loved staying in a house vs. hotel. Great location, close to restaurants, beach, bars, etc. we loved: the location was top notch. literally 5 minute walk to the beach. close to the shops. air conditioning units were great. cute yard, perfect for our dogs. we also enjoyed the outdoor shower. well equipped kitchen. quiet neighborhood, perfect for our baby. what we would like to see improved: the floors were incredibly dirty. our feet were constantly black and gross. also, we singed up as coming with four people (3 adults and one baby) and only got 5 towels for four days, that was not enough. This was the second time we've spent our vacation at Just Beachy Cottage at Tybee. Once again we enjoyed the cottage and our time on the island! Modest home perfect for me and my husband. Five minute walk to the beach. Very quiet. Very clean. Only complaint is that the tub drains slowly. Cozy cottage in perfect location. A couple of blocks to the beach or the back river. Reservation/ check in was easy online and with app. Cottage was clean, adequate space for small family. Home was clean, nicely decorated and very convenient to the beach. So happy you enjoyed our little Just Beachy! The closeness to the beach and the downtown Tybee area really does make it convenient for leaving your car in the free parking at the cottage, and then walking or biking. Give us a call when you are ready for more Tybee time, Denise & the Mermaids. I have stayed at 3 other properties and this was my least favorite. It did not measure up to the other properties. The plumbing in the bathtub was very slow,the faucet fixtures were loose. The microwave kept shorting out. The air conditioners were very loud making it difficult to sleep. Wonderful location! So close to the beach, shops, restaurants - we walked every place. Quiet neighborhood. Cottage is cozy, clean, and comfortable with everything you need for a stay. Screened porch lovely to sit in at night. Highly recommend for a vacation getaway! Just Beachy was the best! Great location, clean, comfortable, great amenities, and very reasonably priced! Lovely little cottage in clean condition with a great location within walking distance to the beach, waterway and town. Just Beachy was just peachy! The cottage was so cute and cozy, and we were able to walk to restaurants and the beach. When we discovered the blow dryer was inoperable, a call to the Mermaids produced a working one within a couple of hours. One thought that we had was that the furniture could have been better placed as the very comfy loveseat was directly under the A/C, as was the single bed in the 2nd bedroom. Our daughter slept in the bunk bed to avoid the air blowing over her. We moved the loveseat away from the cold air and put it back before we left. Other than that, we loved it. Perfect size for me, the wife and boys. Bunk room was great for the kids. Loved the screened in porch! Perfectly acceptable walking distance to beach side AND river side fishing dock. Sad we left the pooch at home. Arrangement would have been perfect for her as well. For convenience and diverse menu of pub eats, I recommend Rock House. For a nice night out, I recommend the Social Club. Just Beachy was just what we were looking for. Just the right size cottage for ourselves and a great location - walking distance to the beach and pier, and to other amenities. Very quiet. Having a washer/dryer was helpful, and the AC in different rooms allowed for different tastes. Bedrooms were very comfortable. Kitchen was small but had everything we needed (we knew in advance there was no dishwasher - no problem). Great stay during a quiet time of the year for the Island. We walked to the pier and dining with ease. Perfect spot for us and our pups. This charming little cottage was a perfect escape for our family. The patio made it, as it doubled the space and gave us an open space for our kids to play in during the day, and for us adults to unwind in at night under the cool patio lights. The location was as good as humanely possible, with the main fishing pier a few blocks to the left, and the awesome river 1 block to the right. Golf cart made everything close, and all the best bars and places to eat where within walking distance. Not to mention, the staff at Mermaid Cottages continually went above and beyond to help us.